For all your flange desires! This when to put the face on. I just used two vertical stitches for eyes. Bind off leaving long tail to close up the little hole, weave in loose end. Join yarn to one of the front loops you left in R11, chain 1, *4 sc in next st, sk 1 st, sl st 1*, repeat 7 times more. Bind off, weave in loose end. 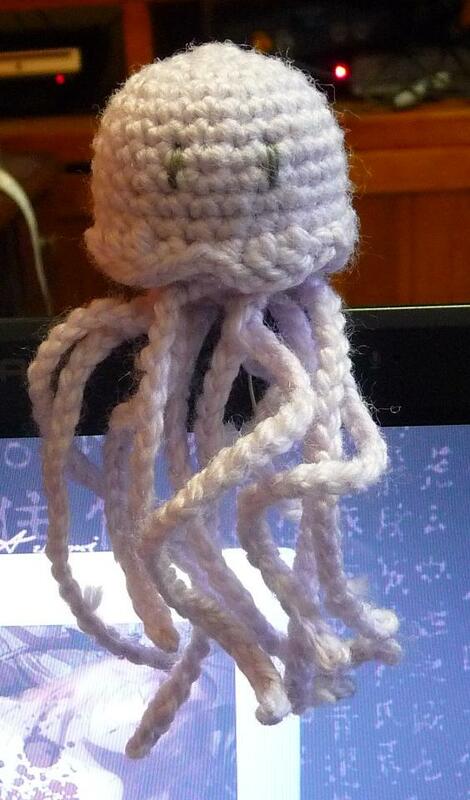 Join yarn to the bottom part of your jellyfish, chain about 20. Bind off and weave the excess back into it. Repeat as many times as you want. Now go forth and make me an army!